Light grey 5 piece jacket suit for baby boys, toddler or older boy, perfect outfit for any special occasion including a christening, wedding as a pageboy, formal occasion. Jacket: Fully lined light grey jacket, double pockets on front with single breast pocket, two centre buttons with buttons on cuffs. Waistcoat: Fully lined plain light grey waistcoat, double pockets, centre buttons, adjustable strap/buckle on back for perfect fit. Trousers: Pleated light grey trousers, double pockets, belt hoops, elasticated on rear for the perfect fit. Tie: Satin effect silver metallic pattern, complimenting the suit perfectly. This suit is made of a light-weight fabric with a standard cut giving a high quality, comfortable fit. Stitched to a high standard with great attention to detail. This light grey 5 piece outfit will make him look like the perfect handsome gentleman at a christening, wedding or special occasion. 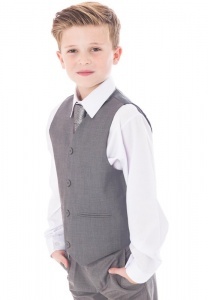 Fabulous suit , looks fantastic on , this is my 2nd Communion suit I have got from this site and I would highly recommend! Also fast delivery to the Republic of Ireland! We got it to Finland quickly and the package contained everything that was promised and it fit the child very well and seems to be good quality. No complaints. 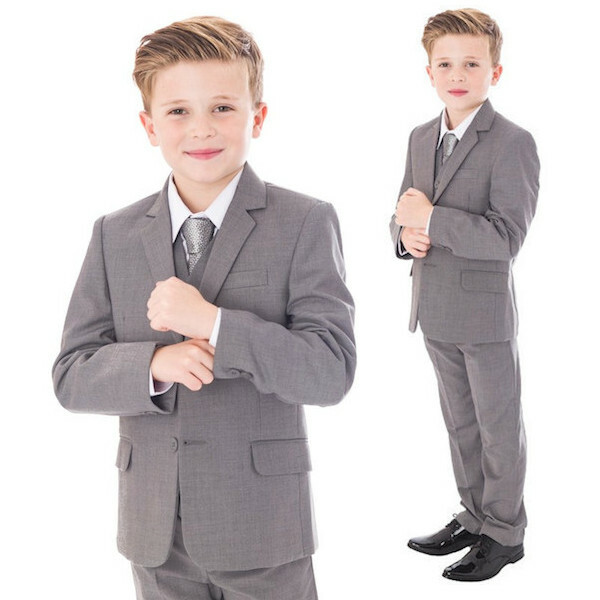 I purchased this suit for my son to wear at my wedding as it wasn't expensive to check the quality before ordering more / other items. 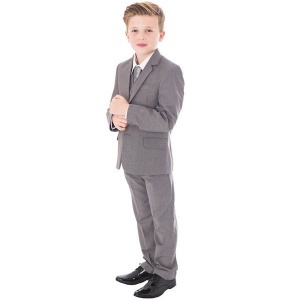 having received it today it really is a very good quality suit and a very reasonable price, just perfect for what we were looking for, the item was dispatched and received very quickly and I can not fault this company or the item at all, I'm very pleased with the whole purchase and so will buy other items. 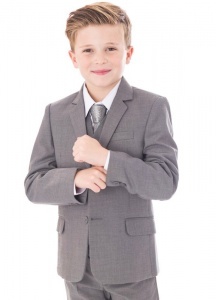 Bought this suit for my son for a wedding. It was a fantastic buy, good quality & great price. All in all it was worth it & my son looked amazing. This is a beautifully made little suit which has all the details of an adult version- double cuff buttons, proper pockets. 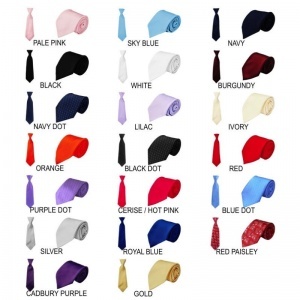 The fabric is soft and very comfortable for a baby to wear. I would highly recommend it. This suit is not only adorable, fits great, and came at a great value, but the whole purchasing process was very simple as well! I live in LA and couldn't find exactly what I was looking for here, well when I found this suit, I knew it was just perfect! It shipped at s very affordable rate and was here in under two weeks!